The Brazil hasn’t seen protests on this scale for over 20 years. Police in riot gear stood behind barriers to protect state buildings in Rio, where over 100,000 people joined the march. 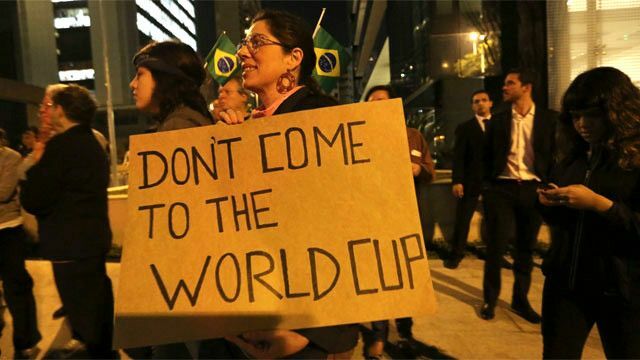 Demonstrators marched through the streets of Brazil's biggest cities, to protest about the rising costs of public transport and the expense of staging the 2014 World Cup. Use one of the words or phrases below to complete each of these sentences from news reports. Note that you may have to change the form of a word to complete the sentence correctly. 1. A tile manufacturer is shedding 75 jobs as part of "restructuring" plans. Johnson Tiles, which employs about 400 people at its factory in Tunstall, Stoke-on-Trent, said the _________ of energy had affected business. 2. The Turkish government worried that the women's funeral might end in violence. As the ceremony ended, a group of several hundred young men marched up the hill towards a police station. Officers dressed in _________ came out to stand in front of the main gate. But neither side confronted the other. 3. King Richard's skeletal remains were found by archaeologists beneath a car park in Leicester, and are due to be re-interred in the city next year. York City Council is _________ events including exhibitions and festivals. 4. Prosecutors described the thieves as "professionals". They had dressed as police, wore masks and were well armed. They forced their way through security _________ and drove towards the Helvetic Airways plane, forcing open the cargo hold to reach gems that had already been loaded. 5. The US has expressed concern over Turkey's handling of the protests and Amnesty International condemned the police's tactics, saying: "The use of violence by police _________ appears designed to deny the right to peaceful protest altogether and to discourage others from taking part." 1. A tile manufacturer is shedding 75 jobs as part of "restructuring" plans. Johnson Tiles, which employs about 400 people at its factory in Tunstall, Stoke-on-Trent, said the rising cost of energy had affected business. 2. The Turkish government worried that the women's funeral might end in violence. As the ceremony ended, a group of several hundred young men marched up the hill towards a police station. Officers dressed in riot gear came out to stand in front of the main gate. But neither side confronted the other. 3. King Richard's skeletal remains were found by archaeologists beneath a car park in Leicester, and are due to be re-interred in the city next year. York City Council is staging events including exhibitions and festivals. 4. Prosecutors described the thieves as "professionals". They had dressed as police, wore masks and were well armed. They forced their way through security barriers and drove towards the Helvetic Airways plane, forcing open the cargo hold to reach gems that had already been loaded. 5. The US has expressed concern over Turkey's handling of the protests and Amnesty International condemned the police's tactics, saying: "The use of violence by police on this scale appears designed to deny the right to peaceful protest altogether and to discourage others from taking part."